Dogs have long been known for their faithfulness and loyalty and now their intelligence is getting attention from scientific researchers as well. For example, Julia Fischer, a biologist at the Max Planck Institute for Evolutionary Anthropology in Leipzig, Germany observed that a nine-year-old border collie named Rico could understand more than 200 words and learn new ones as quickly as a young child. Rico demonstrated his ability to recognize objects simply by their names when he was able to retrieve previously unknown toys placed among already familiar ones. When Rico's owner urged him to fetch a new object, referring to it only by a completely unfamiliar name, the animal identified the new toy correctly seven times out of ten. In addition, a month later Rico recalled the name three out of six times without having seen the toy since the earlier test. “Such fast first-time learning in dogs is remarkable,” says Katrina Kelner, Science magazine’s deputy editor for life sciences. But is such rapid learning in dogs truly so remarkable, or is the word recognition technique used in the Rico study simply a more familiar measure of intelligence to humans than other indicators? After all, intelligence itself may be broadly defined as the ability to cope with new problems and effectively use the power of reason. And according to this definition, dogs have many ways in which to act with intelligence each day. For instance, dogs use their sense of smell, which is up to 100,000 times more acute than that of humans, to cope with new problems in a myriad of ways, such as finding lost people or rescuing them from disasters and sniffing out buried land mines for removal. Dogs can even use their noses to detect changes in a person’s body chemistry. Besides, their ability to reason effectively helps them respond quickly and appropriately in emergency situations, often warning their owners of impending danger or physical harm. Anecdotes from the National Geographic documentary series Dogs with Jobs provide many examples of how canine intelligence is revealed in these ways, often complementing that of humans. In one story from the series, Vera, a Czech shepherd dog, and Manit, her human owner, work to remove landmines in Cambodia. With her keen sense of smell, Vera is trained to find mines by detecting very small quantities of the decades-old vapor the mines emit. The dog’s work is dangerous since the precise location of each mine is unknown, and competing scents from other metallic debris in the area make her job especially challenging. But Vera and Manit continue to work together, risking their lives to prevent local villagers from coming into harm’s way. Another remarkable story about canine intelligence in Dogs with Jobs involves Faith, a four-year-old female Rottweiler whose timely intervention in a medical emergency saves the life of her owner Leana. As a trained service dog, Faith knows how to alert Leana of impending seizures and give her time to get to safety. But one day, Leana falls unconscious onto the kitchen floor. Undaunted, the dog responds as quickly as any human. Using her nose to get the phone off the receiver, she presses 911 on a speed-dial button and barks urgently into the phone. Then, since she is trained to recognize uniformed personnel, Faith readily unlocks the door with her teeth when she sees a police officer approaching to help Leana, who is rushed to the hospital and later recovers. To dogs such as Malcolm, work is a pleasure. 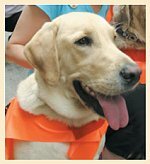 Another remarkable example of canine intelligence is shown in the case of Malcolm, of Quebec, Canada, who begins training as a guide dog for the blind but fails because his eagerness to constantly learn new things does not mesh with the steady temperament needed for such work. Malcolm’s owner does not give up, however, and instead helps Malcolm find his true love in detective work investigating fires of suspicious origin. 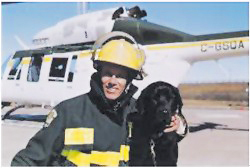 Now, as the only arson dog in Quebec, Malcolm is considered to possess a precision instrument—his nose! His assignments include detecting odors in proportions as small as one part per million, which is equivalent to smelling one drop of gasoline in a swimming pool full of water. A dog's sense of smell is up to 100,000 times keener than that of a human. So it is true that they perceive and often act in ways that extend beyond the realm of human ability. As Supreme Master Ching Hai says, “A pet (dog) is a living creature, a being exactly like us, but just a little more gifted with intuition and sharper faculties. When you look into [animals’] eyes you feel the message—they are equal [to us]. Because they’re so intelligent; they have intelligence. It’s just that they don’t need complicated [brain] like we do.” (Excerpt from DVD # 712 The Divine Intelligence of Animals) And since so many of their actions are carried out in a spirit of selfless service, it is apparent that dogs’ intelligence is pure and loving; so we should always treat them with love in kind.